Speedy Stingray Molly McDonald has signed to St Kilda for the AFLW 2020 Season. You just feel pride, absolute pride ... she really deserves this. 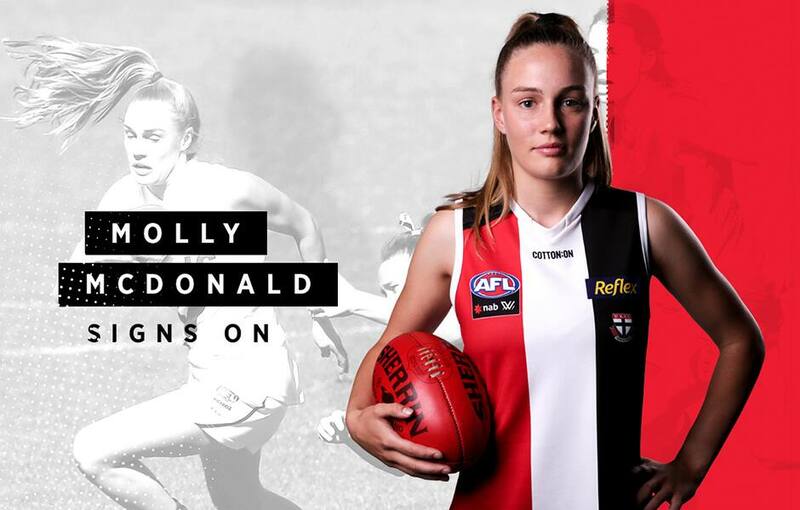 St Kilda’s road to AFLW 2020 continues this week, with the Saints officially securing young gun Molly McDonald. Pre-selected by the Saints from the Women’s AFL National Academy, the 17-year-old winger possesses elite-level endurance and agility as well as a damaging turn of pace. The Year 12 Flinders Christian College student has shown at TAC Cup level that she can push up and down the ground and provide a threatening avenue off half-back when needed. McDonald traded a blossoming basketball career for a shot at footy just three years ago, and the star Dandenong Stingray hasn’t looked back. “I wasn’t enjoying basketball like I used to, and I always wanted to play footy, so I switched,” she said. And for McDonald, the news of securing an AFLW contract is still hard to believe. McDonald grew up kicking a football in the backyard with her older brother, who was ecstatic when he heard the news, while mum Tracey was equally thrilled at her daughter’s success. “You just feel pride, absolute pride,” she said. “Molly works really hard, she’s really disciplined with everything she does really, but if somebody works really hard and they get their reward, they deserve it. McDonald becomes the second player to sign with St Kilda ahead of AFLW 2020, alongside Southern Saints midfielder Ali Brown.